"The world's unfortunate choice for Kadesh Barnea: 1916 AD - Present"
"Has the site been correctly identified? tenth century B.C. - the time of King Solomon." 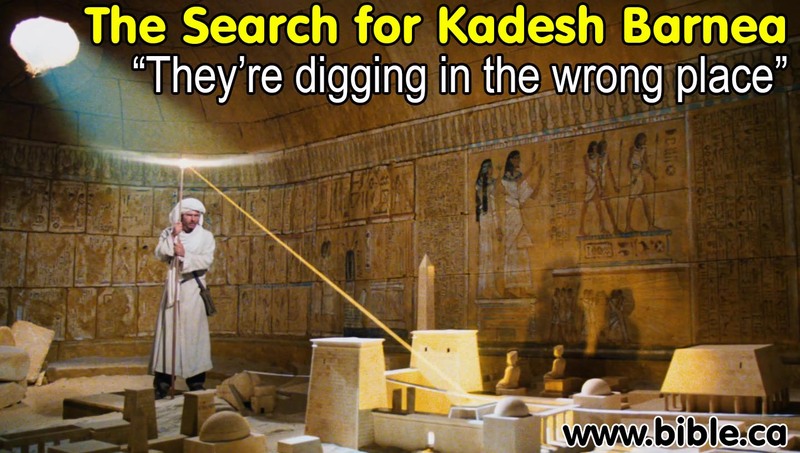 See also: Chronological History of "The search for Kadesh"
Ein El-Qudeirat means "Fountain of Omnipotence" or "Fountain of God s Power"
If you want to take the easy short cut and skip all the reasons from the Bible, history and archeology why Qudeirat cannot be Kadesh, Click here to learn the true location of Kadesh Barnea now. 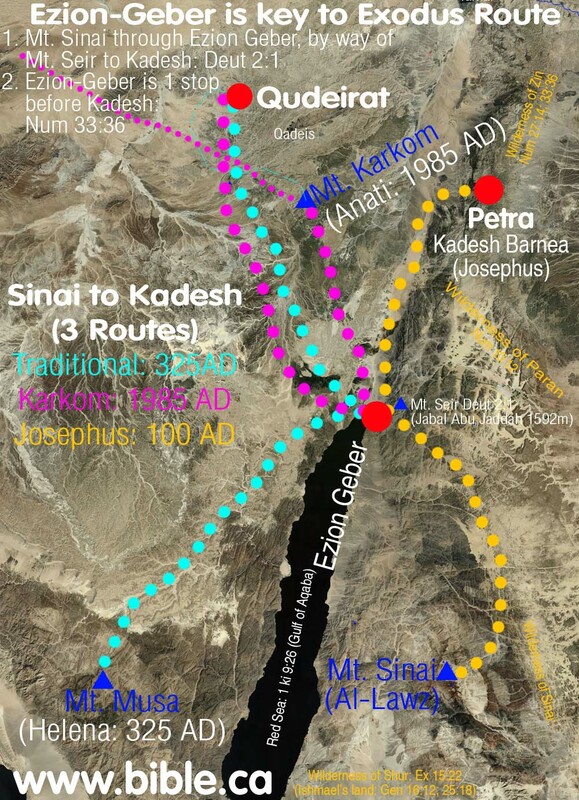 For an detailed summary of the search for Kadesh Barnea see also: Chronological History of "The search for Kadesh"
John Rowlands goes down in history as the man who plunged the search for Kadesh Barnea in to the "Dark Ages" (1881 AD - present). But Ein Qedeis would be just another desert spring without Henry Clay Trumbull who is responsible for literally deceiving the entire world into believing it was Kadesh Barnea. The "one-two punch" of Rowland-Trumbull moved the worlds attention for the location of Kadesh from the Transjordan Arabah to where it has been presently located on all Bible maps since 1916 AD. Although in 1842 AD John Rowlands was the very first man in history to suggest Ein Qedeis was Kadesh Barnea, it became the majority opinion choice for Kadesh Barnea from 1881 - 1916 AD. Before 1881, everyone was looking for it in the Arabah Valley area or near Petra as Josephus said it was. After 1916, Qudeirat became the choice and is still to this very day. We however reject both Qedeis and Qudeirat as Kadesh Barnea and believe it is located at or near Petra. This "similarity of name" argument became the most important "proof" that Kadesh Barnea had been found at Ein Qedeis until Ein el-Qudeirat dethroned Ein Qeudeis in 1916 AD. Scholars like Keil & Delitzsch in 1867 AD, William Smith's Bible Dictionary in 1884 AD and the New Advent Catholic encyclopedia, Cades, 1917 AD all focused upon the similarity of name. But all this was thrown aside and forgotten when a larger spring was found 6 km north at Qudeirat. Ein El-Qudeirat means "Fountain of Omnipotence" or "Fountain of God s Power". This has nothing to do with any connection with God bringing water from the rock with Moses, but the fact that Qudeirat is the largest spring in the entire Sinai Peninsula for a 100 km radius! Not surprising that they would call it "God's powerful spring." 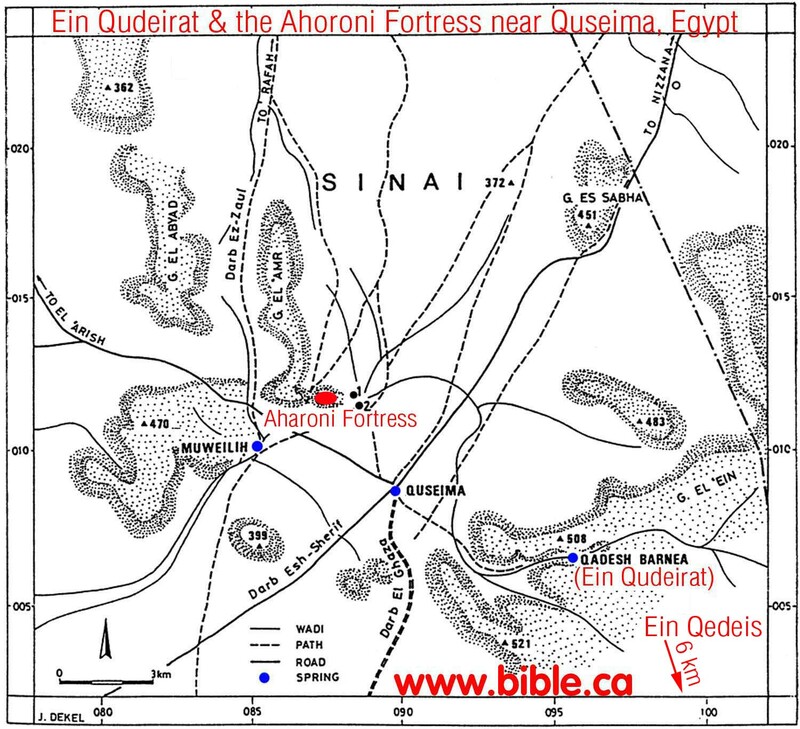 God said in Ex 13:17-18 that He would lead them out of Egypt away from the very area that Qudeirat is located near. Why go to all the trouble of avoiding an area of the Philistines for 2 years at Mt. Sinai, only to have them camp on the Philistines doorstep for 38 years? 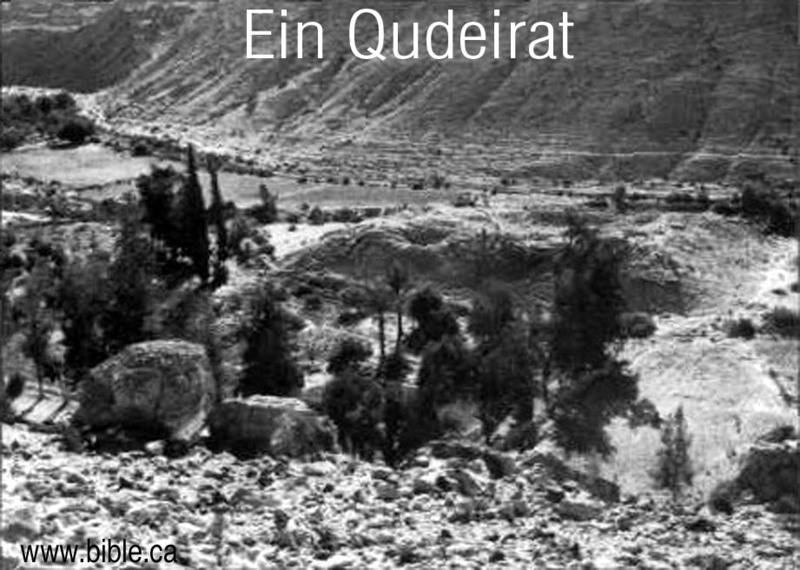 Although discovered years earlier, Ein El-Qudeirat was first identified as Kadesh Barnea in 1916 AD. It has been the world's unfortunate choice for Kadesh ever since even to the present time. 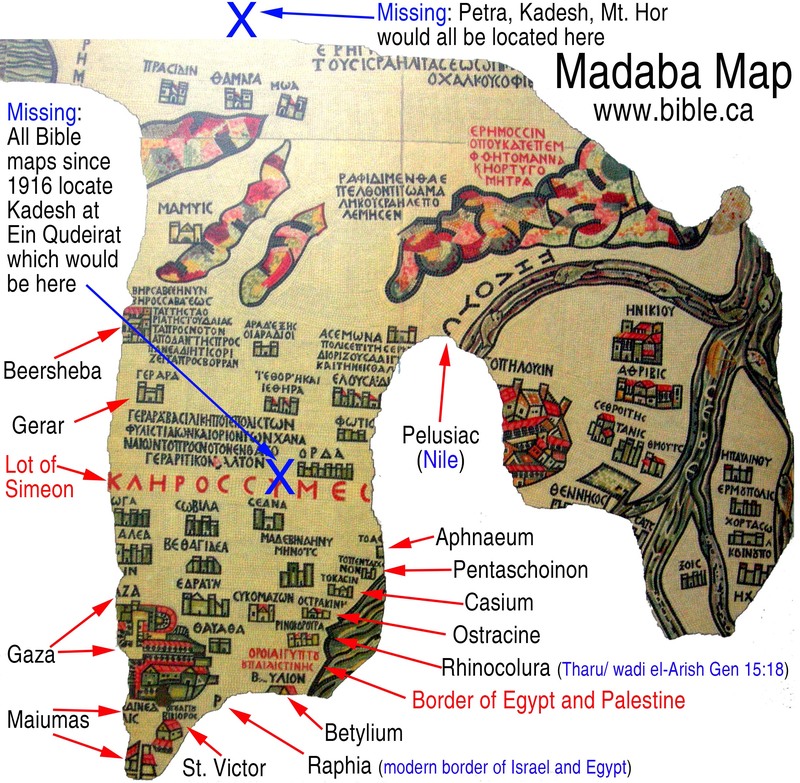 Virtually all Bible maps incorrectly place Kadesh at Qudeirat. Ein El-Qudeirat is located in Wadi el Ein, a narrow dry valley that is a few kilometers long. Four ostracons were found at Qudeirat. This one was found in the youngest (highest) level about 700 BC. It is a conversion chart between Hebrew and Egyptian numbering systems. Ein El-Qudeirat cannot be Kadesh Barnea because it directly contradicts the Bible. Qudeirat is located 27 km inside the promised land. The wadi Al-Arish, or River of Egypt, was the formal stated boundary between Egypt and Israel (Gen 15:18). It is also the western boundary of the land of Judah. (Num 34:5; Josh 15:4,47; 13:5; 1 Ki 8:65) It is absurd to suggest that the children of Israel spent 38 years "wandering in the wilderness" well inside the promised land. This reason alone is all that is needed for anyone who believes the Bible to reject Ein El-Qudeirat as Kadesh Barnea. It is important to remember that the modern border of Israel since 1948 AD is at least 35 km east of where the border was in 1406 BC. Many people miss the fact that Qudeirat is actually located in the promised land because they are looking at modern maps. Qudeirat is the largest oasis in the Sinai Peninsula. 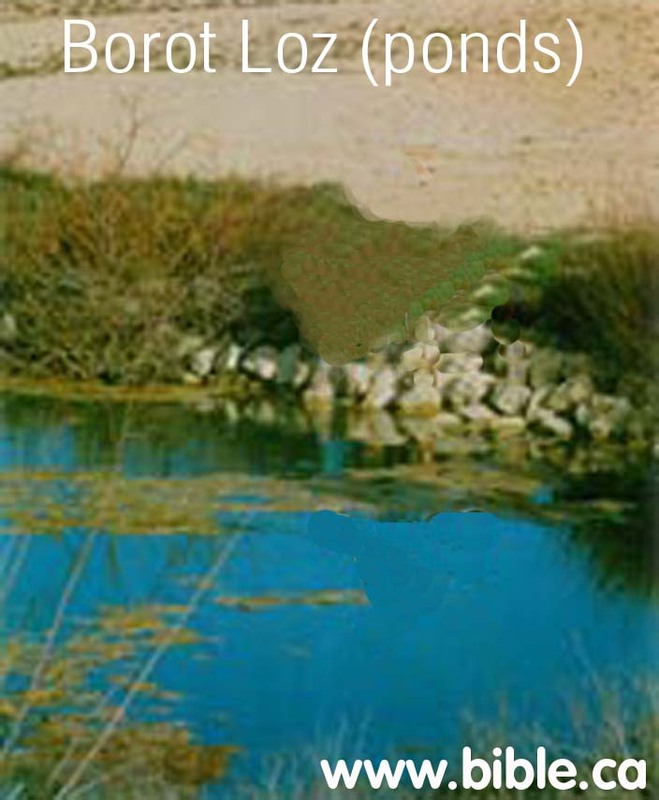 Add the nearby oasis' at Quseima , Muweilih and Qedeis to Qudeirat and it simply does not fit the general description of Kadesh being a place where Israel bitterly complained about having no water. This is the place where Moses had to strike the rock to bring water for Israel. More details on Moses striking the rock at Kadesh. If it wasn't for the deceptions of Henry Clay Trumbull in 1884 AD, everyone would have continued to look for Kadesh transjordan, at or near Petra or in the Arabah valley. Trumbull's lies about the "New England look" of Qedeis, tricked the world into thinking it was Kadesh. 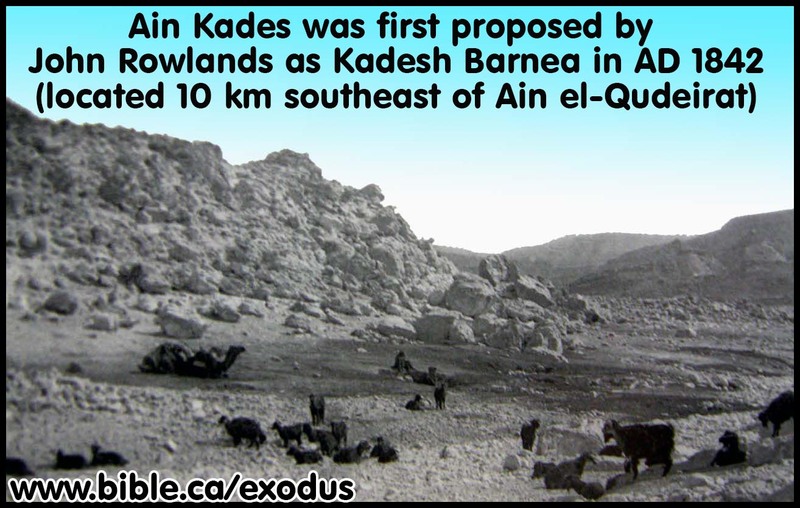 15 years later, when the next person arrived at Qedeis, it was rejected as Kadesh and Ein El-Qudeirat became the new location for Kadesh. Qudeirat is only 6 km north of Qedeis. Archeologists have found nothing in the entire Quseima area which includes Qedeis and Qudeirat, that is older than the time of Solomon (950 BC). 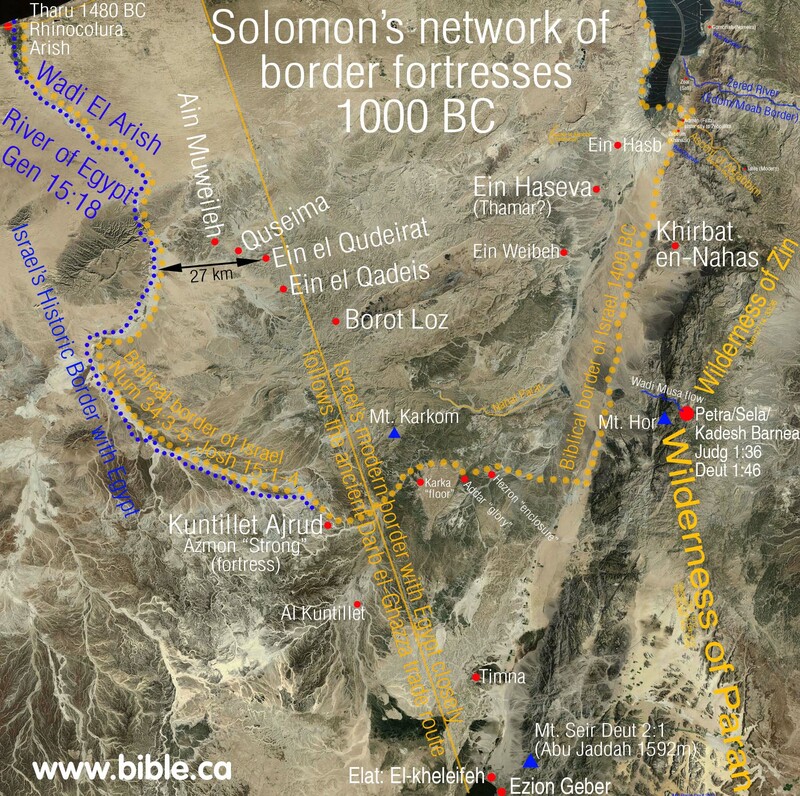 Archeologically, we do find a series of military border fortresses built by Solomon at each of these locations, but this is 450 years too late to be connected with the exodus of 1446 BC. Ein El-Qudeirat is located at the most important and central crossroads of the Sinai. There are four different crossroads that all converge in the Quseima area: Darb Esh-Sherif, Darb El Ghazza, Darb Ez Aaul, Darb El Arish. Since God was molding the culture and religion of the Hebrews during their 40 years in the wilderness, it makes no sense for God to have Israel spend 38 years in one of the most multi-cultural places in the middle east. God tucked Israel off in an isolated corner so he could cultivate his nation to worship him. Attempting to do this at the ancient equivalent of "Time Square" is significantly unlikely. 2.5 million people died at Kadesh. There are no mass grave sites located anywhere near Ein El-Qudeirat. 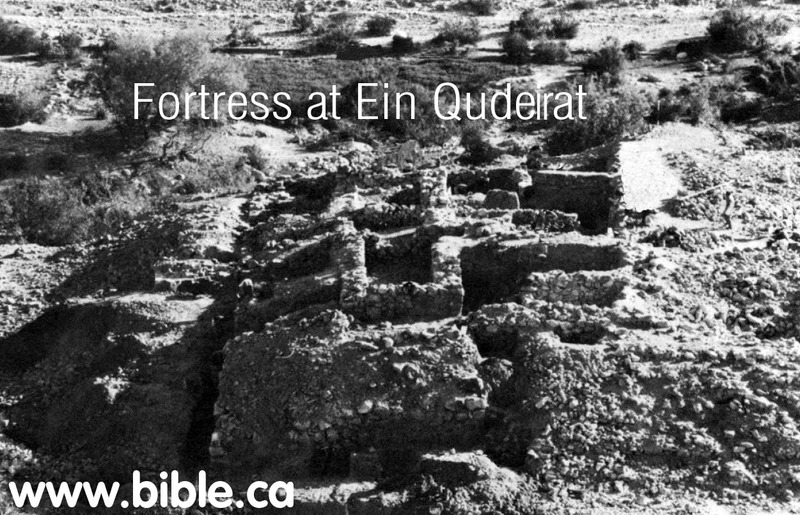 Ein El-Qudeirat is located at least 100 km away from the land of Edom. Kadesh Barnea was located near the border of Edom. While many modern maps show the territory of Edom beside the Quseima area, this is not supported by archeology, but circular logic. They reason that Edom's border was located beside Kadesh, and since they falsely assume Kadesh is located at Ein El-Qudeirat, they just "pencil in" the land of Edom, nearby and randomly chose a new location for Mt. Seir and Mt. Hor where Aaron was buried! 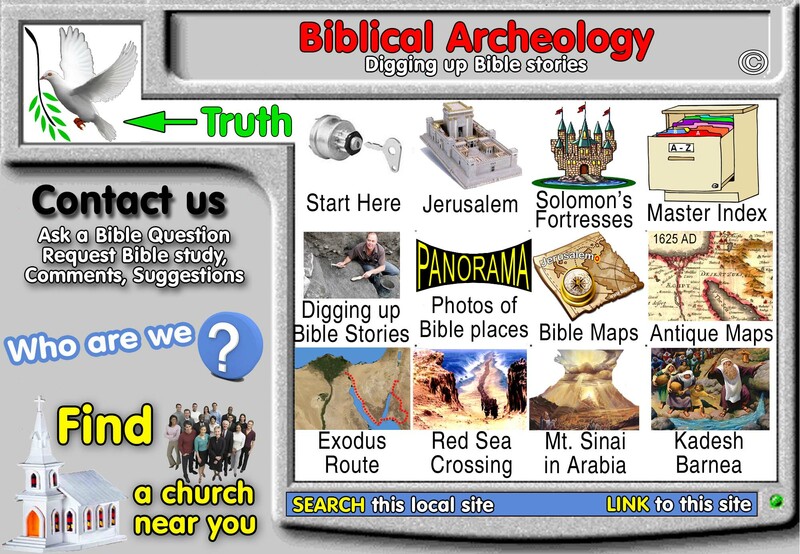 The problem is that both archeology and the Bible agree that Edom's territory was transjordan until after the Babylonian captivity of 605 BC when Nebuchadnezzar conquered all of Judah and took control of Jerusalem. It makes absolute non-sense of the story of asking Edom for permission to cross their territory to enter the promised land. They would just head straight north for Beersheba and not go the extreme long route across the Negev to the Arabah, then south to Ezion Geber, then east, then north to Mt. Nebo where Moses died. Of course, the Edomites did not even begin to inhabit any part of Judah until after Nebuchadnezzar first invaded in 605 BC. Map of the Quseima area showing the location of Ein Muweileh. The largest oasis area in the modern Sinai will produce many major roads from all directions. Quseima was the "Time Square" or "Grand Central Station" of the Sinai. Not only was Qudeirat the largest single oasis in the Sinai, it was one of four springs in close proximity to each other. The four springs of the Quseima district are listed here from largest to smallest: Qudeirat, Qedeis, Quseima and Ein Muweileh. Solomon built three border fortresses in close proximity to four of the springs: Forts were located at Quseima (which had two springs nearby) and Qudeirat and Qedeis. From a strategic point of view, the Quseima fortress was the most important because it was the most westerly and therefore closest to the Egyptian border and it overlooked the crossroads. The border between Egypt and Israel as stated in the Bible, is the wadi el-Arish. NOTE: For a complete summary of the search for Kadesh Barnea see: Chronological History of "The search for Kadesh". The section below only deals with Qudeirat, the period of 1916 AD - present. 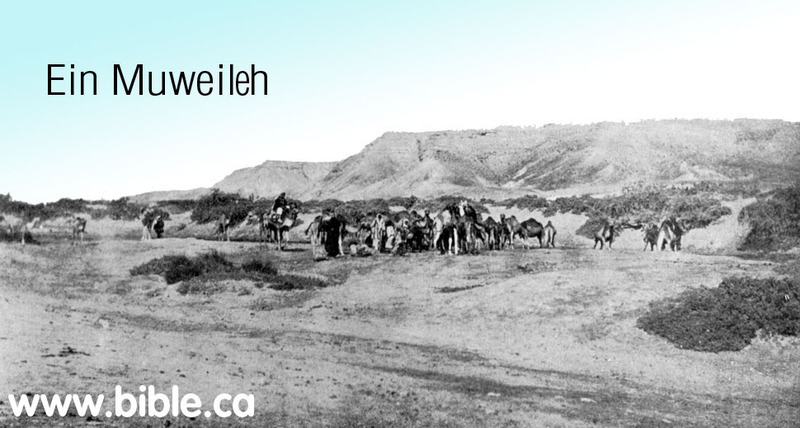 Woolley and Lawrence published their book in 1916 AD in which they chose Ein El-Qudeirat as Kadesh Barnea, and the entire world jumped on board with them. 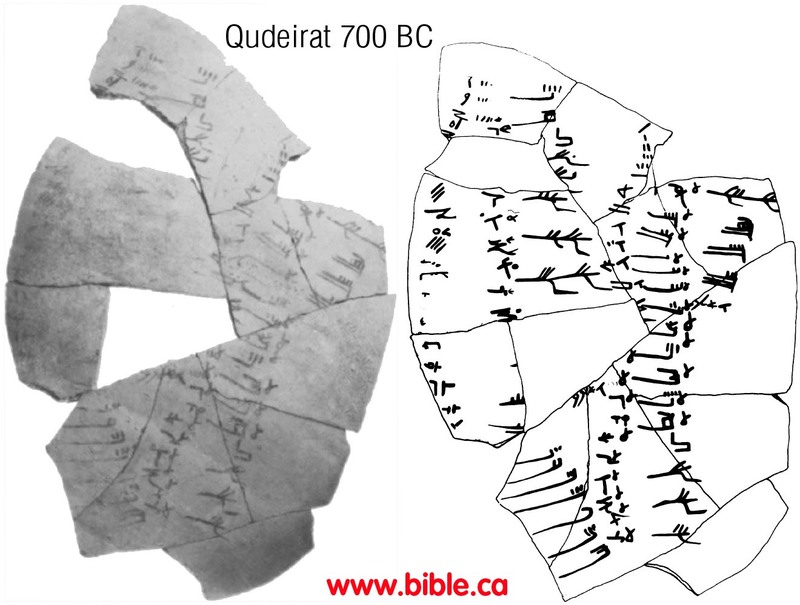 Woolley and Lawrence really had only superficial information when they chose Qudeirat as Kadesh. They made many mistakes typical of the science of archeology of the time. For example, at Tell el-Kheleifeh (ancient Elat) "Glueck threw out most of the common wheel-made pottery he excavated; he did not realize this common wheel-made pottery was far more reliable for dating purposes than the handmade pottery he saved.)" (Jezirat Faraun: Is This Solomon's Seaport?, Alexander Flinder, 1989 AD) This was 25 years after Woolley and Lawrence excavated at Qudeirat. Who knows what errors they made? Excavations at Qudeirat were carried out 1914-1915 AD by Woolley and Lawrence. They published their finds in the book The Wilderness of Zin. This book convinced the world that Qudeirat was in fact Kadesh and so it so to the present time. Shortly after 1916 AD, the world rejected Ein El Qedeis for Kadesh. The new location for Kadesh was about 10 km north at Ein el-Qudeirat after Woolley and Lawrence published their book. 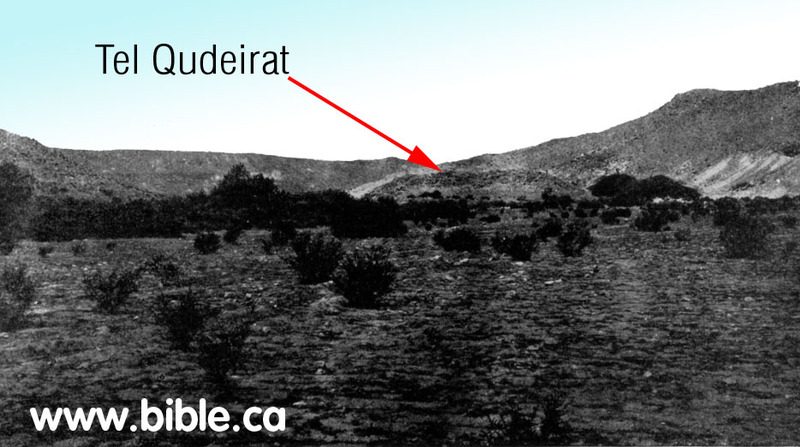 Qudeirat has been the almost undisputed location for Kadesh Barnea from 1916 to the present time. However Qudeirat simply cannot be Kadesh Barnea for a long list of reasons discussed elsewhere. Today Ein El-Qudeirat is still the location for Kadesh Barnea in almost every Bible map produced. This is a grave mistake since Kadesh Barnea is located transjordan, near or at Petra, right where Josephus and Eusebius in the Onomasticon said it was. Ein El-Qudeirat, was the location of one of Solomon's fortresses he built to protect the border in 950 BC. 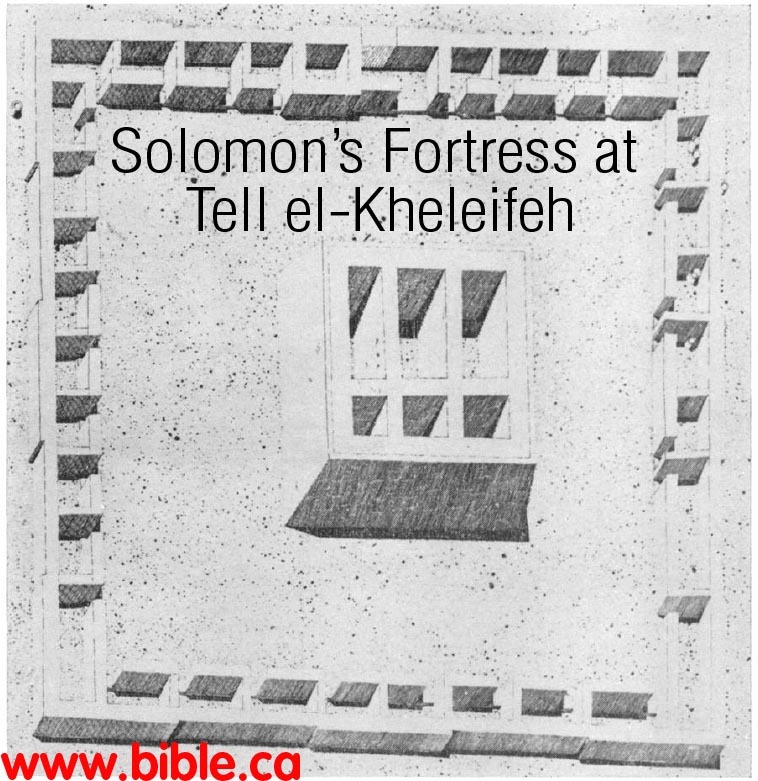 For more details see: Solomon's network of military border fortresses. Next thing you know they proclaim the site to be Kadesh Barnea with the expectation that further detailed archeological evidence would prove such. Darwin had the same wishful thinking when he assumed future discoveries of fossilized animals would give direct evidence evolution between ape and man. Today anthropology has proven Darwin wrong and archeology has proven Woolley and Lawrence wrong. Although millions of fossilized animals have now been found not one is transitional as Darwin expected. Likewise, after extensive archeological investigation of Qudeirat, nothing earlier than the time of Solomon has been found. Darwin hoped for the missing link that is still missing. Woolley and Lawrence hoped for the missing "pottery" that would prove that Moses lived there for 38 years. Rudolph Cohen echoed the same hopes of Woolley and Lawrence, yet in 2008, we still have found nothing earlier than 950 BC at the site. The late Rudolph Cohen, like Darwin also expected further discoveries to vindicate the site as Kadesh. Although he noted that he had excavated down to virgin soil, he also noted that only a portion of the site had been excavated down to virgin soil. He indicated his hopes that future excavations (still have not been done today) would provide the evidence he lacked. Rudolph Cohen recognizes that all the man made structures at Qudeirat do not predate Solomon but were part of the border fortress network. This ostracon was found in the youngest (highest) level about 700 BC. It is a conversion chart between Hebrew and Egyptian numbering systems. 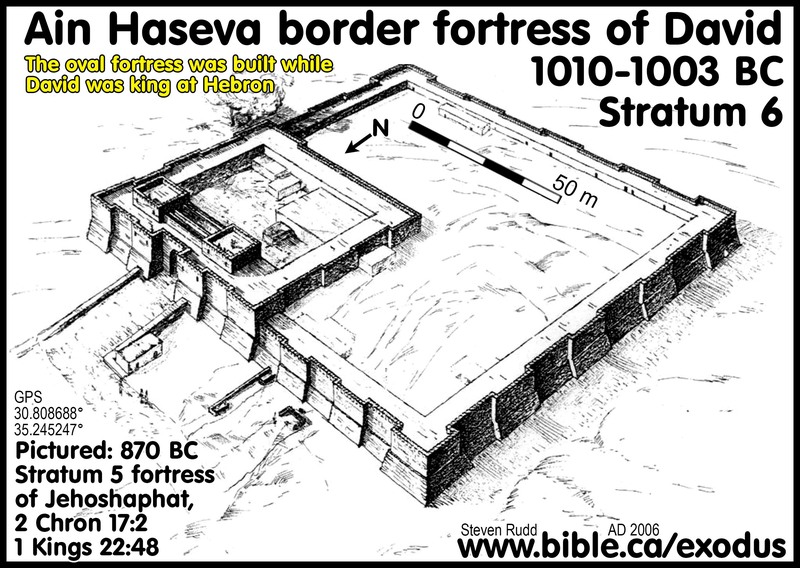 The oldest fortress is the oval one built by Solomon in 950 BC. Beneath the oval fortress is virgin soil. It is important to realize that the four springs at the Quseima area have been in continuous use from before the time of Abraham. We do not doubt that evidence will one day be found that predates the Solomonic fortress network. The problem is that this evidence must specifically show that the Hebrews were here for 38 years between 1444 and 1406 BC. 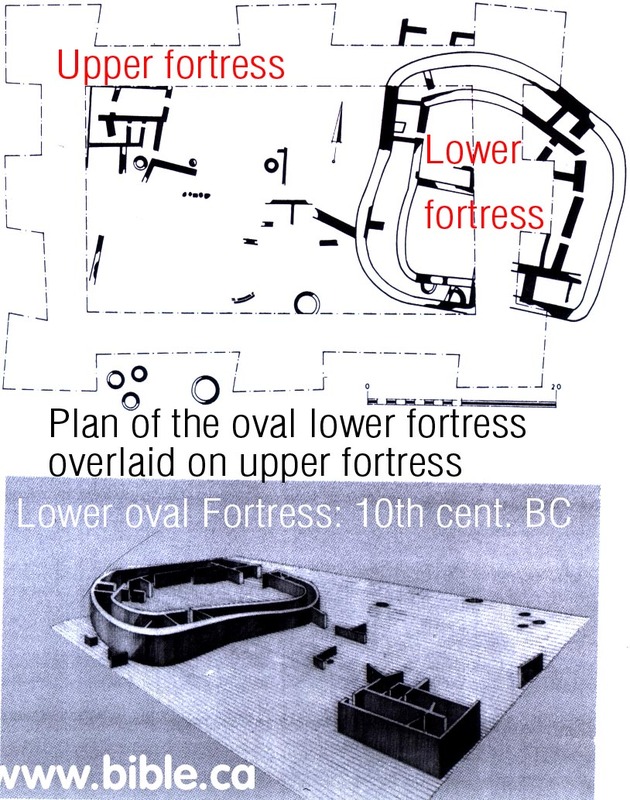 Although the oldest oval fortress was excavated by Cohen, there are sections of the two younger fortresses that have not excavated down to virgin soil. Cohen expects to find exodus period (1444 BC) evidence under the areas of the older fortresses that have not yet been excavated down to virgin soil level. 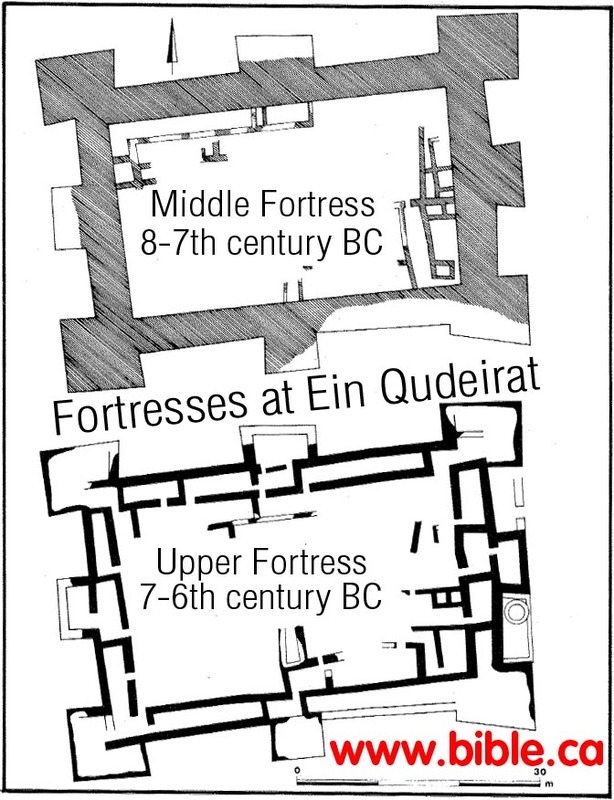 Cohen suggests that the reason Qudeirat is the only one of three fortresses in the Quseima area that was rebuilt twice, is for sentimental reasons, since it was Kadesh Barnea. In other words, the fortresses were memorial structures in addition to military outposts. While this is possible, it is unlikely, since nothing has been discovered in any of the three forts that were built, that suggests the location was Kadesh. It such had been found, we would surely have heard about it! So that is the sum of the archeological evidence that Kadesh is located at Qudeirat: "Nothing yet, but lets keep digging" and the fact it is the only fortress Solomon built that was rebuilt twice because of its sentimental connection with the 38 years Israel spent there while sojourning in the wilderness before they entered the promised land. 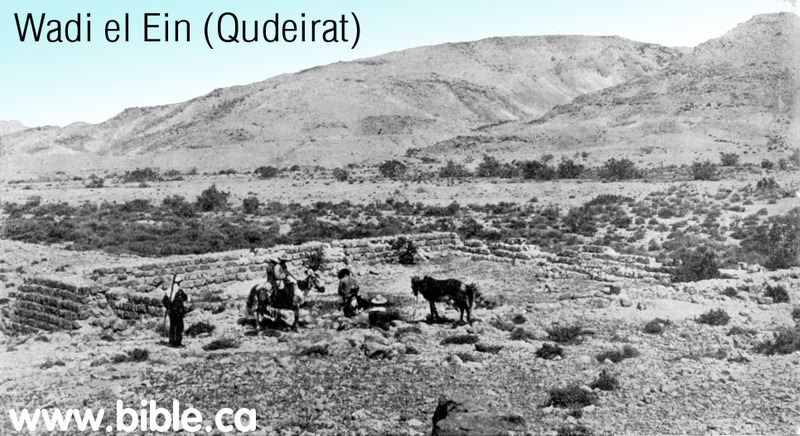 Need we remind you that Qudeirat was located 28 KM inside the formal stated border of the promised land: Wadi el-Arish? 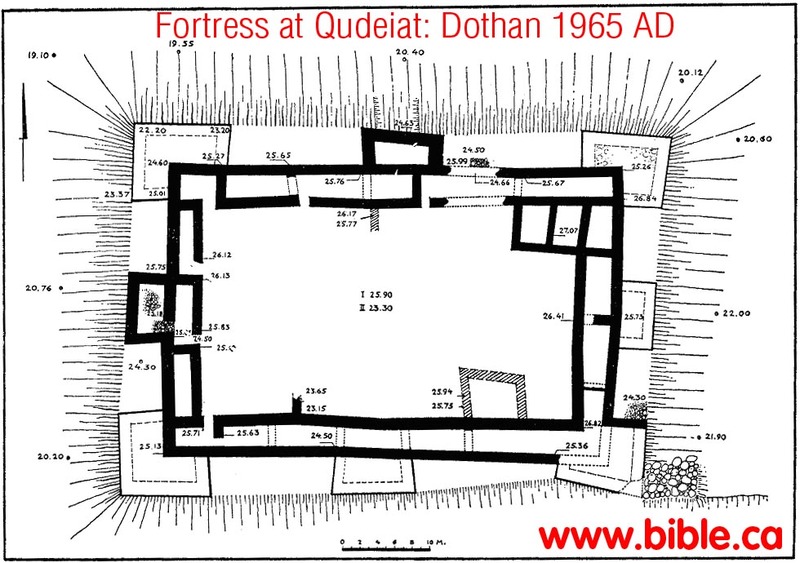 Qudeirat was the only fortress Solomon built, that was rebuilt two additional times, with the exception of Ezion-Geber, which was rebuilt once. The reason Qudeirat was rebuilt twice (three buildings) is not for sentimental reasons, as Cohen suggests, but because of the large water supply. Remember there were four springs in the Quseima area. What is true today in Israel was true in 950 BC: "Its all about the water"
We find Cohen's opinion to be wishful thinking in light of the fact that he admits nothing from the exodus has ever been found there. 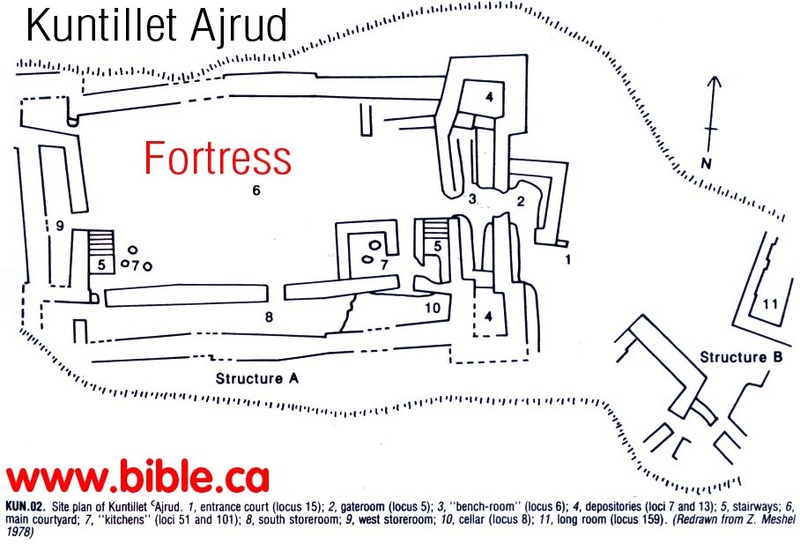 The real reason why the fortress at Qudeirat was rebuilt twice: Simply put, it was Israel's claim of sovereignty over the two eastern springs at Qudeirat and Qedeis. Egypt had control and sovereignty over the two western springs at Quseima and Muweileh. There was obviously an agreement between Egypt and Israel to share the water resources. 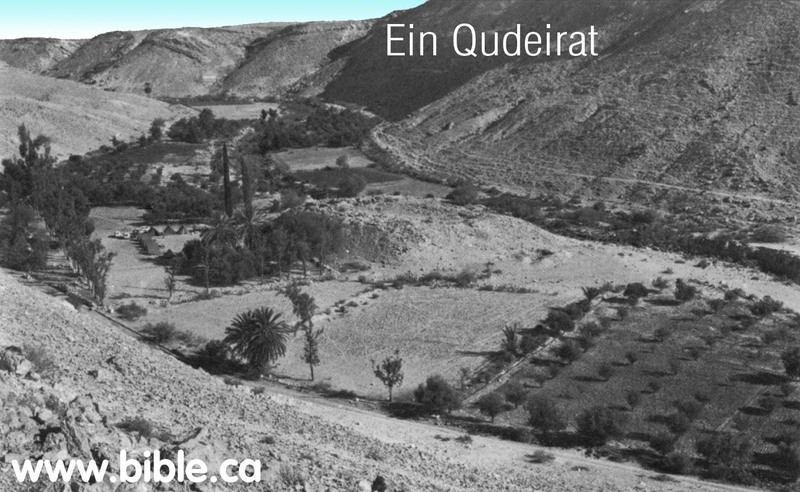 Qudeirat was Israel's "stake in the ground" that guaranteed their half share of the water at the largest oasis in the Sinai. At the time of Solomon, Israel's border extended all the way to the Wadi el-Arish. However, after Pharaoh Shishak destroyed the entire network of fortresses, the border moved east to share the water. At that time, Egypt and Israel agreed that the border divided the springs so that each had two, Qudeirat is the location that the Jews built to protect the water at Qudeirat and Kades. Egypt would get the water from the springs at Quseima and Ein Muweileh. It also divided the control of the four ancient trade routes that intersected just west of Qudeirat. So you have the Egyptians on the west of this major crossroads of traffic and two springs completely under their control and the Hebrews on the east of the major crossroads with two springs of their own. Qudeirat represented the western most point of control of the Judean kingdom under Uzzah and Josiah. Qudeirat was the "border town" between Egypt and Israel after 900 BC. We reject Cohen's suggestion that sentimentality is why Qudeirat was rebuilt twice. Remember, the springs in the Quseima area were the largest in the entire modern Sinai Peninsula. Qudeirat was the largest of the four springs, need we say more? It is obvious why Qudeirat was built three times! Its all about the water! For an examination of radiocarbon dating see click here. The science of radiocarbon dating and the process which dates are selected is rather unreliable at best. Typically a single sample will be tested and retested until a date close to what the person who submitted it is looking for is produced. Then, that result is chosen as "the date" even though 20 other dates were rejected. This is well documented, but not well known by the general public. For example "1470 Scull" was tested over 40 times until they got the date they were looking for. Skull 1470 discovered by Richard Leakey is supposed to be an ancestor to man, too. Leakey and others obtained 41 potassium-argon dates for this skull, all of which they rejected because the date obtained was not "right"? Finally Leakey used an argument based on the size of pigs teeth found in the strata to get the date for skull 1470 that he thought was correct. Here is a discussion specifically about radiocarbon 14 dating. In 2005, Hendrick J. Bruins, Johannes van der Plicht published their analysis of the three fortresses in light of Radiocarbon dating tests conducted on all three fortress levels including other sites in the Negev. In summary, they vindicated Cohen's view that there were three distinct levels of occupation (not two) separated by periods of non use. Regarding the upper fortress, they vindicated Cohen's date and that it was destroyed in 586 BC by Babylon. The middle and lower fortresses, however, they shifted the dating to about 150 years old. In other words, based upon radiocarbon dating, they suggested, that the middle square fortress was built by Solomon and destroyed by Shishak and the lower fortress was built about 1100 BC. 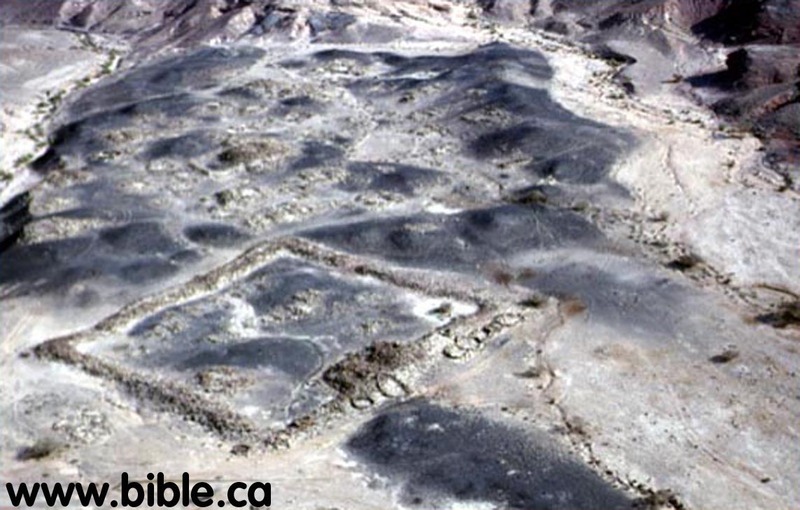 Cohen said that the lowest/oldest oval fortress was built by Solomon and destroyed by Shishak. The radiocarbon dates that Bruins and van der Plicht came up with do provide, on face, a rather shocking rebuke of Ussishkin's/Finkelstein's view that there are two occupation levels, the earliest being long after Solomon died. What is more sure, is that there are three occupation dates. What is less sure, is the relative dating of all three. In other words, given the nature of all radiometric dating, specific dates are always less important than relative dates from a single site. Even Bruins and van der Plicht admit that the presence of charcoal on the site would give a slightly older date than the actual date: "We note that the old-wood effect may lower the date to some extent at Tell el-Qudeirat" (The Bible and Radiocarbon Dating, Thomas E. Levy, Higham, Bruins, Plicht, 2005, p362) Given the fact that the lowest fortress was indeed burnt with fire, this by their own admission, reduce the 150 years with which they differ with Cohen. The radiocarbon dates do not help in identifying the site as Kadesh Barnea, since there is still a 300 year gap of occupation from the first oval fortress back to the exodus of 1446 BC. There is no evidence from any ancient written source or tradition that Kadesh Barnea is located at Qudeirat or anywhere near the Quseima area. We expect to one day find archeological evidence at all of the four Quseima area springs that predates Solomon. These springs did not first start being used just because Solomon built three fortresses here in 950 BC. The evidence, however, must be specifically "Hebrew" from the time of 1446 - 1406 BC. Kadesh Barnea is located at or near Petra. Click here to learn the true location of Kadesh Barnea!